Notebooks again. Is Moleskine your style but you find the paper a little lacking? Well Leuchtturm claims to have you covered with the 1917 line of notebooks. Specifically I’m reviewing the black pocket (dot) hardcover version. Starting with the outside, the dimensions are nearly the same width- and thickness-wise as the Molsekine, but about half an inch taller. As the Field Notes and Clairefontaine pocket books are the same size (lacking thickness) you could compare it to them as well. 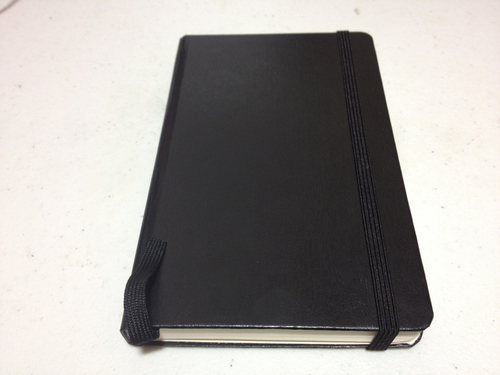 The cover is in the black Moleskine style and is almost indistinguishable. It is also fairly flexible, something entirely absent in the Moleskine. It has an elastic band that feels slightly cheaper, but nonetheless works well. The most disappointing thing is the spine, which constantly creases, cracks and groans. The problems appears the be that the cover on the joints is separate from the binding. The binding does feel solid, so I don’t believe it will fail, but the spine will definitely encounter cosmetic damage with prolonged use. Inside there is a standard back pocket, an address and name blank, and several table of contents pages, helpful little things if I do say so. Also the last few (six) sheets can be torn out and are as such perforated. Each page is numbered and of course there’s a bookmark ribbon. 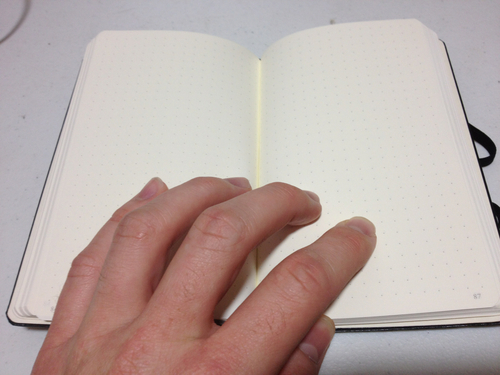 It has about the same sheet count, and same page color as the Moleskine, but with better paper. The Leuchtturm has 80 gram paper that is supposedly ink resistant. I can say it is, I didn’t even get bleed-through with a flex pen. That being said, everything shows through to the point of being annoying, even a ballpoint pen. Only pencil makes for a clean, two-sided drawing experience. Though the paper, unfortunately, is not very smooth at all, especially not as much so as the Molsekine or Clairefontaine books. You’ll get a lot of feedback on this one. The rulings are all standard and nothing to write home about. So, how does the Leuchtturm perform? Well. It performs well. It’s cheaper than the completion and better in some ways. Most of these things are up to personal preference. I would say the binding is a little weak on this one, but other than that it’s up to par. This entry was posted in advanced, Sketchbooks and tagged 1917, black, good, leuchtturm, moleskine, notebook, paper, pocket, pocket book, review, small, style by Dragon Co (Austin Smith). Bookmark the permalink.